Until the end of this week folk ensemble Nemunas, one of the oldest art societies of Kaunas University of Technology (KTU) is performing for Japanese audience. Nemunas is participating in the festival Ritoania NOW (eng. Lithuania now), taking place in Gifu prefecture. 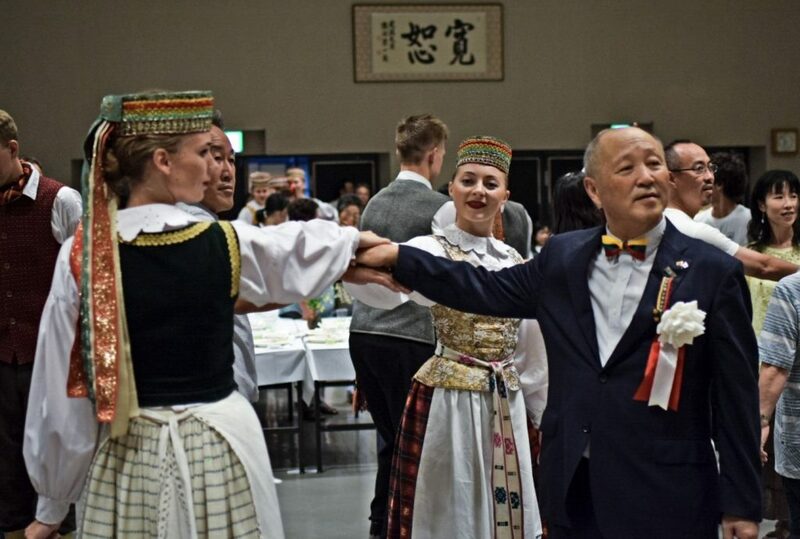 The ensemble has prepared an exceptional repertoire for Gifu residents and tourists – an hour long programme was featuring Lithuanian folk songs, dances and music. The ensemble musicians were wearing traditional costumes of different Lithuanian regions. During the concert Nemunas used authentic Lithuanian folk instruments, such as Baltic psaltery, wooden bells and pipes and others. “Also, we wanted to surprise our audience by singing their favourite song about sakura blossoming in Japanese”, says Margarita Tomkevičiūtė, the leader of the Ensemble. Nemunas concert is the main accent of the festival Ritoania NOW, dedicated to the centennial of Lithuanian state. Taking place in Gifu for the first time, the festival is connected to Sugihara Week programme, organised for the memory of Chiune Sugihara, a Japanese diplomat who has saved 6 thousand Jewish citizens of Lithuania from holocaust by issuing them transit Japanese visas. Chiune Sugihara was born in Gifu, and was working in Kaunas in interwar period. “The Festival renders the opportunity to spread Lithuanian musical traditions not only among young Japanese people, but also among the general audience attending the concerts”, says Klaudija Aleksandravičiūtė, Head of Arts Societies at KTU. She believes that Nemunas’ visit to Japan is a perfect way to initiate more intensive cultural cooperation between the two countries. The first step is already taken – Lithuanian-Japanese friendship association was founded in Gifu prefecture earlier this year. In September, the representatives of this region are planning to come to Chiune Sugihara Week organised annually in Kaunas. Nemunas is already planning its concerts during the event. Check out Nemunas concerts and travels on their Facebook page. Join Nemunas, the most travelling of KTU art societies.